HUNT, JOHN J. " JACK " JR. John J. "Jack" Hunt, Jr., 66, of Ansonia, entered into eternal rest on Thanksgiving morning, November 22, 2012, at Griffin Hospital, with his loving family by his side. He was the beloved and devoted husband of Denice Rowley Hunt. Mr. Hunt was born in Ansonia on May 26, 1946, son of Phyliss Uberti Hunt of Ansonia and the late John J. Hunt, Sr. He was a graduate of Ansonia High School and later Wichita State University in 1971, where he excelled in football. A proud lifelong resident of Ansonia, he was employed as the Truant Officer for the Ansonia Board of Education since 1972. 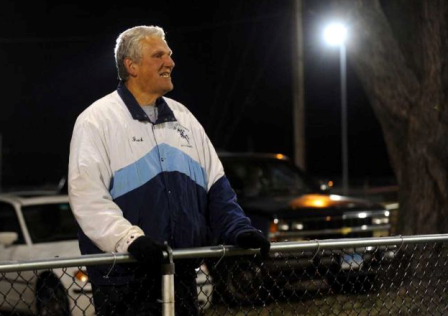 Also in 1972, he began his legendary career as an Ansonia football coach and served as head coach from 1987 to 2005, retiring with an overall record of 193-26. He was currently Ansonia High School's golf coach and freshman basketball coach. He previously coached track and girls softball. Even though he stood at 6-7 and weighed 275 pounds, he was known as a "gentle giant" with a heart as big as him. In addition to his wife and mother, he is survived by three loving sons, John J. Hunt III and his wife Michele of South Salem, NY, Joseph J. Hunt and Jeffrey J. Hunt, both of Ansonia, a loving daughter, Lorri Hunt Shortell and her husband Michael of Ansonia, a brother, Robert P. Hunt of Seymour, a sister, Joanne Hunt Davis of Stratford, five cherished grandchildren, Jordan, Jessica, and Jailyn Hunt of Seymour and Michael and Malori Shortell of Ansonia, father in law and mother in law, Joseph and Jacklyn Rowley of Murrells Inlet, SC, brother in law, Kevin Rowley and his wife Patricia of Ansonia, sister in law, Marcia Bilodeau and her husband David of Ansonia, maternal aunts, Elizabeth Matricaria of FL and Angelina Sciarappa of Derby, several nieces, nephews, friends, and canine friend Ryleigh Jayne. Visiting hours for Coach Hunt will be held on Sunday, November 25, 2012, from 3-7 pm at the Church of the Assumption, 61 North Cliff Street in Ansonia. On Monday, November 26, 2012, relatives and friends are also invited to attend a Mass of Christian Burial at 9:30 am (Please Meet Directly) at the Church of the Assumption. Per Jack's wishes, his burial will be private. In lieu of flowers, memorial contributions in Jack's name may be made to the Boys & Girls Club of the Lower Naugatuck Valley Ansonia Clubhouse, 28 Howard Avenue, Ansonia, CT 06401 or Boys & Girls Village, 528 Wheelers Farm Road, Milford, CT 06461. The SPINELLI-RICCIUTI FUNERAL HOME, 62 Beaver Street in Ansonia, has been honored and privileged with Jack's arrangements and care of his family.